As CE separation technology now achieves fragments in excess of 1000 bp, GeneMarker® software has a new sizing technology in addition to the traditional Local Southern, Cubic Spline and third order least squares options for the middle fragments. These traditional methods provide highly accurate sizing for 50 - 600 bp, (ILS™600, ILS™500, GeneScan™HD400ROX™, GeneScan™500LIZ®-or 500ROX™, GeneScan™600, CEQ™400, CEQ™600, ET™400-R, ET™550-R) but have significant difficulties obtaining accurate size calls for data in excess of 800 bp, due to the nonlinear migration of larger DNA fragments. 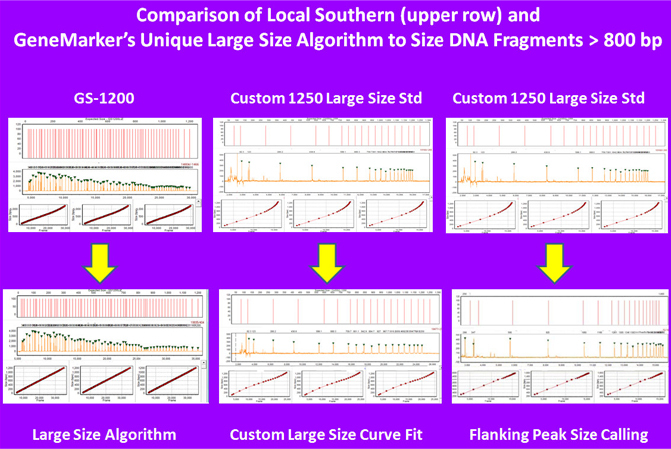 GeneMarker Software's "Large-Size" sizing technology provides accurate, linear sizing, one bp-resolution, using a DNA derivative migration time correction on fragments range from 30-1400bp (GeneScan™1200LIZ®) from ABI PRISM®, Beckman CEQ™ or MegaBACE™ genetic analyzers. The "Large-Size" technology provides cost-reducing multiplexing opportunities, such as the addition of 4x-probes to clinical assays such as MLPA®, Allele Specific Amplification (ARMs™, ASA, OLA, etc.) forensic and ecology analysis including TILLING®, STR/microsatellite profiles, AFLP, T-RFLP, VNTR, ARISA, MLVA and BAC-fingerprinting. Size Calibration Charts for review of Sizing Quality for all samples. Easily edit/update sizing calls for capillaries with decreased quality. Save or print the calibration charts for documentation of sizing quality for the project.